Comprehensive Care for Traumatized Children: An open trial examines treatment using trauma systems therapy. One of the primary challenges in the development of effective interventions for traumatized children is that the same factors that place a child at risk for exposure to traumatic events also contribute to an unstable social environment. Traumatized children frequently live in environments characterized by domestic violence, child maltreatment, parental mental illness, and substance abuse — conditions that have been demonstrated to be detrimental to child development. This atrticle describes the results of an open trial of an innovative model of care for traumatized children, trauma systems therapy (TST). TST is designed to address both a child's trauma-related symptoms and the perpetuating factors in the social environment. The trial was conducted at Boston Medical Center, Boston, MA, and in Ulster County, New York. Traumatized children have great difficulty with self-regulatory functions.9–16 Children who experience traumatic stress can have tremendous difficulty in controlling their emotions, behavior, and attention when faced with environmental threats and in reconstituting themselves to terminate their extreme responses.10,11,13,14,17–19 This cascade of events leading to dysregulation may be triggered by genuine environmental threats, perceived threats resulting from the child's misinterpretation of actual events, the child's extreme response to seemingly innocuous stimuli, or a combination of these three effects. When faced with threatening signals, children who have experienced traumatic stress respond immediately and extremely in ways that are not appropriate for the demands of the social environment. Their information processing often is disoriented or disorganized. This extreme incapacity to self-regulate is the core feature of traumatic stress and involves highly evolved and deeply ingrained brain systems that help the individual survive in the face of threat. Standards are developing for effective social environmental interventions for traumatized children.20–24 There is also a growing amount of literature on effective interventions for both self-regulation and traumatic stress in children.25–30 TST integrates these standards into an intervention program specific to the problems of traumatic stress in children. TST is designed to provide an integrated and highly coordinated system of services guided by the specific understandings of the nature of child traumatic stress. This model views the development of traumatic stress in children as resulting from two main elements: a traumatized child who is not able to regulate emotional states, and a social environmental system that is not able to help the child contain this dysregulation. The essence of TST is to help the child gain control over emotions and behavior by diminishing the ongoing stresses and threats in the social environment and by enhancing the child's capacity to regulate emotion. This intervention also is designed to build the capacity of others in the child's environment to help the child control his or her emotional and behavioral responses. A detailed description of the complete treatment parameters is beyond the scope of this article.31 A brief overview of the structure is provided instead. TST focuses interventions on the “trauma system,” defined as the failure of the natural systemic balance between the developing child and his or her social environment. Healthy development requires a regulatory balance or “goodness of fit” between the child and the social environment in which the social environment is equipped properly to help the child. When children enter service systems, this “goodness of fit” includes the system of care. A trauma system occurs when there is a failure of this regulatory balance between the traumatized child and his or her social environment, system of care, or both. TST details an approach to assessing this “fit” between the child's emotional regulation capacities and adequacy of the social environment and system of care to help the child. Based on the assessment, TST then offers a variety of treatment modules. We designed the intervention approach to help with the severe problems in children's environments in ways that are consistent with principles of child development and systems of care. Accordingly, a series of interventions are chosen that correspond to this fit between the traumatized child's emotional regulation capacities and the ability of the child's social environment and system of care to help him or her manage emotion or to protect him or her from threat. These interventions include home- and community-based care, emotional regulation skills training, services advocacy, trauma processing, and psychopharmacology. TST assesses traumatized children along two dimensions: a gradient of emotional dysregulation, and a gradient of social environmental instability. Children and families are assessed according to the degree to which the social environment is stable and the degree to which the child is able to regulate emotional states. Treatment plans are developed out of these two dimensions of assessment by placing the child in one of five phases of intervention: surviving, stabilizing, enduring, understanding, or transcending (Table 1, see page 444). The intervention is then constructed around the particular condition (phase) in which the child and social environment are placed. Each phase of treatment corresponds to a different theme of traumatic stress therapy, and a different menu of services. The child or social environment travels through the phases of therapy with a main goal to achieve regulation and stability. These phases are described inTable 2. Throughout, the approach to treatment is iterative, with additional information influencing the course and nature of interventions. We recognize that progress through treatment is rarely linear, and that families may move between stages as new challenges arise. Throughout the process, there is an ongoing effort to draw on the target family's strengths and to infuse culturally syntonic interventions into the clinical work. In 2004, an open trial of TST was conducted in two locations: Boston Medical Center Child Psychiatry Outpatient Clinic (BMC), and Ulster County, New York, Departments of Mental Health and Social Services (UC). A total of 110 children at either BMC (n = 36) or UC (n = 74) were assessed at intake and referred to TST services. Children at BMC were seen by the Child Psychiatry Trauma Team, an outpatient multidisciplinary team trained in TST. BMC is located in an inner-city urban area and serves families from this neighborhood. Children from UC were seen as part of a partnership between the Department of Mental Health and the Department of Social Services in an integrated program called Nexus. Ulster County is located in a rural area of New York. Both locations experience similarly high rates of poverty and trauma. For the purpose of this study, participants from both locations have been grouped together. A total of 61 boys and 49 girls between ages 5 and 20 were seen across the two sites (mean age = 11.21, standard deviation [SD] = 3.60). Primary clinicians completed an assessment of child symptomatology and functioning at intake and 3 months later using the Child and Adolescent Needs and Strengths – Trauma Exposure and Adaptation Version (CANS-TEA) (Kissiel C, Lyons M, Saxe G, Ellis BH, unpublished data). The CANS-TEA is a 54-item clinician-report instrument that assesses a variety of domains relevant to treatment. These include trauma history, traumatic stress symptoms, emotional and behavioralregulation, environmentalstability, caregiver functioning, attachment, child strengths, and child functioning. Clinicians rate each item on a scale of 0 to 3, ranging from no evidence of a problem to evidence of a severe problem. Higher scores indicate greater impairment. The overall instrument showed excellent internal consistency (Chronbach's alpha = 0.95). Research personnel at BMC and UC reviewed patients' charts and identified any patients receiving care from either of two clinical teams that were trained in the TST model as potential participants. Clinicians included licensed psychologists, social workers, psychiatrists, nurse specialists, and trainees from these disciplines. In addition, a lawyer was part of some clinical team meetings and provided consultation and legal services related to advocacy needs as part of the TST model. Thirty-one (28%) of the children across both sites were lost to follow-up at 3 months. They did not differ on any of the symptom or functioning variables from those who remained in treatment with the exception of behavioral regulation, which was worse for those who did not remain in treatment (mean = 4.69, SD = 2.46 versus mean = 3.33, SD = 2.54). Participants who dropped out had greater histories of sexual abuse (mean = 1.36, SD = .74 versus mean = 1.19, SD = 1.08; P < .05) and neglect (mean = 1.55, SD =1.08 versus mean = 1.04, SD = .91; P < .05). Results therefore will be presented on the 82 children who remained in the study (28 BMC, 54 UC; 48 boys, 34 girls; mean age = 11.2 years, SD = 3.6). At baseline and 3 months, the CANS-TEA items were summed to produce scales with adequate internal consistency: PTSD symptoms (Chronbach's alpha = 0.72), emotional regulation (alpha = 0.57), behavioral regulation (alpha = 0.61), caregiver's physical and mental health (alpha = 0.57), caregiver psychosocial support and stability (alpha = 0.66), social environmental stability (alpha = 0.70), and child's psychosocial functioning (alpha = 0.76). Due to inadequate statistical power to detect large effect sizes at P < .05 (minimum n = 26)32 the subscale child strengths (n = 14) was dropped from analysis. 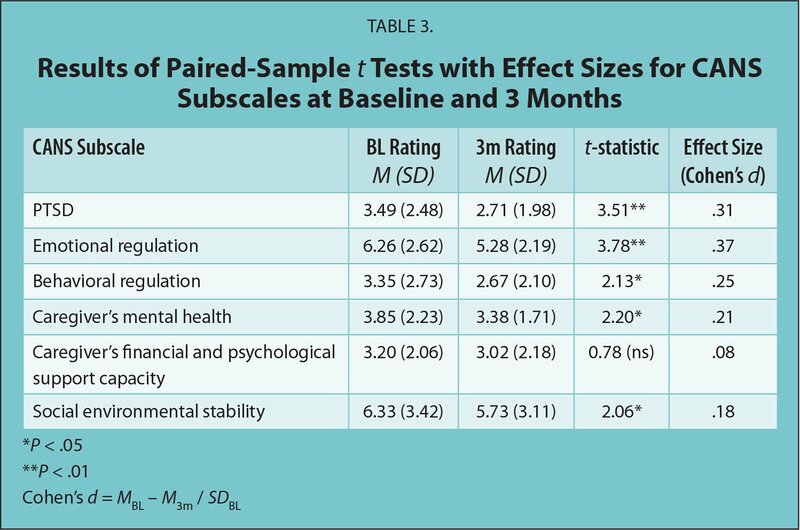 To detect changes in the 7 target CANS subscales, we used paired sample t tests and computed effect sizes with the formula MBL − M3m / SDBL.33 Results are shown in Table 3 (see page 446). Significant changes were observed in the expected positive directions for all six analyzed subscales with modest effect sizes (P < .05; d = .21 to .37). we computed residual gain scores for the 6 CANS subscales that changed significantly after 3 months of TST. Residual gain scores “control for initial differences between individuals and measurement error inherent in the use of repeated measures on the same instrument.”34,35 Because this was an open trial of a new treatment, we used these residual gain scores to identify potential correlates of treatment change for future hypothesis testing. Regarding direct targets of treatment change, residual change in children's functioning (ie, greater improvement) was strongly and positively correlated with residual changes in those dimensions that are specifically targeted by TST. These included behavioral regulation (Spearman's rho = 0.50; P < .01) and stability of the social environment (rho = 0.34; P < .05), but not emotional regulation (rho = 0.21; ns). To determine whether outcomes related to TST could contribute to a child requiring less intensive intervention, we examined the proportion of children receiving more intensive treatment during the surviving and stabilizing phases versus less intensive treatment during the enduring, understanding, or transcending phases. At intake, 57% of the children were assessed to be in the surviving or stabilizing phases of TST, which are defined by intensive interventions focused in the home and community. Forty-three percent of children were assessed to be in the office-based intervention phases of TST: enduring, transcending, and understanding. At 3 months follow-up, fewer children were in the intensive phases of surviving and stabilizing (41%) and more children were assessed in the less-intensive office-based phases (58%). Accordingly, TST contributed to significantly more children transitioning from more to less intensive phases of treatment during the 3 months of this study (McNemar X2 = 5.33; P < .05). Significant changes in the expected directions toward improvement were observed after three months of TST. Children receiving TST improved on several dimensions of psychiatric symptoms, but more important, the treatment effected measurable changes in children's social environments, and residual gains in both psychiatric symptoms and social-environmental stability were strongly and positively correlated with residual gains in clinician-rated assessments of children's functioning at three months. There are several limitations to this study. First, because this was an open trial, we did not include a comparison group and are unable to determine if positive changes reflect natural healing over time or are a direct result of TST. A randomized controlled trial of TST will be an important next step in determining effectiveness. A second limitation is that the outcome measure described here is clinician report and thus subject to bias. Additional studies including self-report and parent-report measures, as well as independent evaluators, will be important to conduct. Despite these limitations, this study demonstrates positive findings for the use of TST with traumatized children seen in two different settings. One notable strength of the study is that it was conducted in relatively uncontrolled, “real world” settings and thus may be generalizable to other clinic and community settings. These findings indicate that TST may be a particularly effective treatment for remediating not only a child's emotional regulation problems but also the social-environmental instabilities that contribute to and perpetuate psychopathology. Garbarino J, Kostelny K. What children can tell us about living in a war zone. In: Osofsky JD, ed. Children in a Violent Society. New York, NY: The Guilford Press; 1997:32–41. Groves BM. Children Who See Too Much: Lessons from the Child Witness to Violence Project. Boston, MA: Beacon Press; 2002. Osofsky JD, Scheeringa MS. Community and domestic violence exposure: effects on development and psychopathology. In: Cicchetti D, Toth SL, eds. Rochester Symposium on Developmental Psychopathology: Developmental Perspectives on Trauma. Rochester, NY: University Of Rochester Press; 1997:155–180. Perry BD, Pollard R. Homeostasis, stress, trauma, and adaptation. A neurodevelopmental view of childhood trauma. Child Adolesc Psychiatr Clin N Am. 1998;7(1):33–51, viii. Putnam FW. Dissociation in Children and Adolescents: A Developmental Perspective. New York, NY: The Guilford Press; 1997.
van der Kolk BA, Fisler RE. Childhood abuse and neglect and loss of self-regulation. Bull Menninger Clin. 1994;58(2):145–168. England MJ, Cole RF. Preparing for communities of care for child and family mental health for the twenty-first century. Child Adolesc Psychiatr Clin N Am. 1998;7(3):469–81, vii. Ghuman HS, Weist MD, Sarles RM, eds. Providing Mental Health Services to Youth Where They Are: School- and Community-Based Approaches. New York, NY: Brunner-Routledge; 2002. Henggeler SW, Schoenwald SK, Borduin CM, Rowland MD, Cunningham PB. Multisystemic Treatment of Antisocial Behavior in Children and Adolescents. New York, NY: The Guilford Press; 1998. Pumariega AJ, Winters NC, eds. The Handbook of Child and Adolescent Systems of Care: The New Community Psychiatry. San Francisco, CA: Jossey-Bass; 2003. Stroul BA, Friedman RM. A System of Care for Children With Severe Emotional Disturbances. Washington, DC: Georgetown University Child Development Center, National Technical Center for Children's Mental Health, Center for Child Health and Mental Health Policy; 1994. Saxe GN, Ellis BH, Kaplow J. Comprehensive Care of Traumatized Children: The Trauma Systems Therapy Approach. New York, NY: The Guilford Press. In press. Surviving Indicated for children with behavioral dysregulation and a social environment in which there is a frank threat to the child's well-being. Involves intensive home-based services to stabilize child and environment. Frequently also includes psychopharmacology, advocacy, and coordination with other systems of care (eg, inpatient or department of social services). Stabilizing Indicated for emotionally or behaviorally dysregulated children with a threatening or distressed social environment. Services involve intensive home-based care and may also include office-based emotion regulation skills training, psychopharmacology, and advocacy. Enduring Indicated for children with some degree of difficulty with emotional or behavioral regulation and also some environmental instability. Focus of treatment is to help child develop emotion regulation skills and to bolster capacity of social environment to support child's emotion regulation. Understanding Indicated for children with some emotional dysregulation but no high-risk behaviors. Social environment should hold no frank threat and should be able to provide some assistance to child. Focus of treatment is on cognitive processing and may also include psychopharmacology. Transcending Final phase of treatment, for children who show good emotional regulation skills and a social environment that can containand support child's regulation. Focus of treatment is on making meaning of trauma and terminating therapeutic relationship. Dr. Saxe is chairman, Department of Child and Adolescent Psychiatry, Boston University Medical Center, and director, Center for Medical and Refugee Trauma, National Child Traumatic Stress Network, Boston, MA. Dr. Ellis is assistant professor, Department of Child and Adolescent Psychiatry, Boston University Medical Center, and associate director, Center for Medical and Refugee Trauma Department of Child and Adolescent Psychiatry. Dr. Fogler is postdoctoral research fellow, Department of Child and Adolescent Psychiatry, Boston University Medical Center, and National Center for PTSD, Boston VA Healthcare System. Ms. Hansen is unit leader, Mental Health Department, Family and Child Unit, Ulster County, New York. Ms. Sorkin is associate commisioner, Department of Social Services, Ulster County, New York. Address reprint requests to Glenn N. Saxe, MD, Department of Child and Adolescent Psychiatry, Dowling 1 North, One Boston Medical Center Place, Boston, MA 02118, E-mail: glenn.saxe@bmc.org. This project was supported by SAMHSA grant U7. The following people contributed to the development of the trauma systems therapy program: Julie Kaplow, PhD; Robert Casey, PhD; Wanda Grant Knight, PhD; Carolyn MacDuffee Chapman, MSW, LICSW; Theresa Cain, MEd; Kendra Johnson, MA; Joel Goldstein MD; Tom Faxon, MSW, LICSW; Pamela Tames, JD; Ellen Lawton, JD; Amanda Sonis, JD; Molly Benson, PhD; Michelle Bosquet, PhD; Stephen Luippold, CNS; Kathy Caproni, PhD, Cheryl Qamar, Barbara Myers, Marcia Julius, and Karin Hubbs.